Crude Oil has managed to produce a daily upside exhaustion alert as of June 2nd. This is the ninth such signal since the invasion of Kuwait in 1990. A 50% correction of the most recent rally ($57.65) from $46.70 to $68.60 will be a reasonable initial target. 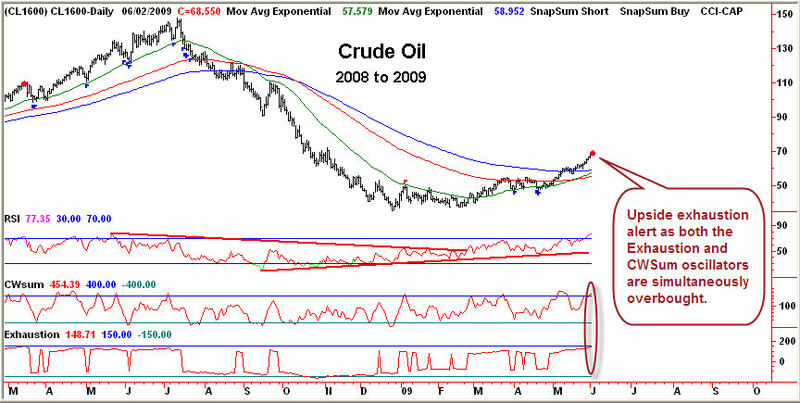 The run to Peak Oil at $147 eleven months ago matched the pattern of the commodities boom in the early 1970’s. In particular, it most resembled copper. Last June, oil generated upside exhaustion alerts on a weekly and monthly basis. The subsequent decline generated daily capitulation alerts in the second week of October. We recognized that the optimum strategy was to bypass the oil and do covered writing in the related stocks in anticipation of a multi-month consolidation. By December-January there were weekly and monthly capitulation alerts in place as the price based out in the mid $30’s to high $40’s. Resistance was expected in the low $50’s and then again at $58 to $60 as prices first tested the 100-day moving average and then the 150-day average. So, while the patterns have mimicked one another, crude oil accomplished a more bullish bias at the bottom and staged a better rally. July-August would represent an appropriate time window for the next tradable low especially if the daily RSI(14) reading is into the low 30’s.